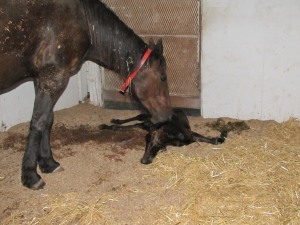 Canada: Canada Euthanising Their Foals Moments After Birth Because They Fear Financial Ruin ! Subject: Canada euthanising their foals moments after birth because they fear financial ruin ! PLEASE SHARE AND RESPOND WITH ANY IDEAS YOU MAY HAVE AND OR CONTACT INFO THAT CFAWR CAN UTILIZE? Hasn’t Steven Harper’s government done enough to allow animal cruelty to permeate this country ? QMI Agency spoke to a number of sources who say breeders are now are euthanizing their foals moments after birth because they fear financial ruin if they have to raise the horses with no chance of recouping their investment. This means heartbroken mares and foals like this one who will never know but a few moments of life. “They (the breeders) definitely don’t want to be doing this, but without knowing there’s going to be some sort of stability in the industry, they feel like they don’t have a choice,” the person said. Brian Tropea, the general manager of the Ontario Harness Race Association, said he agreed “100 per cent” with the statement. “There’s a definite sense of panic here,” said Tropea in an interview. The Ontario Lottery and Gaming Commission’s March announcement to end its revenue-sharing agreement with racetrack site-holders shocked the industry, said Tropea, who added that people within the racehorse industry became unsettled very quickly. He said breeders made decisions 11 months ago to breed their mares, expecting to pay stud fees after the foals were born healthy. “When they made those decisions, they were all hoping to raise healthy, strong foals,” Tropea said. Had the government’s and the OLG’s plans been announced or eluded to even three years ago, Tropea said the province’s horse breeding industry wouldn’t be in a financial bind today. He said racehorses are bred until early July, and the length of conception is 11 months. Racing starts for some horses as early as two years old, giving breeders a chance to begin to recoup their costs. But if there’s no hope to ever race the horse, raising it to be sold as a pleasure horse could be prohibitive. On average, a breeder can look to spend about $2,500 a year for veterinary care, $130 a month for shoes, approximately $10 a day for lodging and food, all on top of the stud fee, which can range anywhere from $2,000 to $20,000. “For most people in the industry, they’ll feed their horses before they feed themselves,” Tropea said. He said Ontario has been advertised heavily as a being the best place to breed horses in North America. People from all over the world have bred their horses in the province, and with the changes recently implemented that will likely come to a halt. “We’re going to be missing opportunities now,” Tropea said. Horses are generally sold between 18 and 20 months, and range in cost depending on breeding stock. “If there’s no racing industry, those foals that used to go for $20,000 are going to be sold for $500 to $600,” Tropea said. News Shorts From Our Friends At OIPA, Italy. After the delivery of over 112.000 signatures to ask real measures for the protection of stray animals in Europe, OIPA returned in Bruxelles on 24 April to assist at the meeting of the European Parliament’s Petitions Committee. Massimo Pradella, OIPA International Chairman, explained what happens every day to stray dogs in Europe, in particular in Spain and Romania, the total absence of animal protection laws and the economic interests around strays. Six petitions, signed by thousands of European citizens, have been presented to ask a specific directive on the protection and the management of the strays’ population of all Europe. Andrea Zanoni, Member of the European Parliament, underlined also that 400 members of the European Parliament signed the Written Declaration on Dog Population Management. The European Commission representative assured that they will contemplate the possibility to add a regulation concerning strays on the European Union Strategy for the Protection and Welfare of Animals 2012 – 2015. Erminia Mazzoni, president of the Petitions Committee, confirmed that a resolution for the stray population problems will be early proposed to the European Parliament. “The EU should promptly intervene on those European countries that everyday kill thousands of strays, because in the next two years many other animals will be abused and killed – said Massimo Pradella – anyway we are glad that the European Commission replied positively to our requires”. The European Parliament approved the written declaration 49/2011 about the limit of 8 hours for the transportation of animals for slaughter in Europe, presented by Andrea Zanoni, Vice President of the Animal Welfare Intergroup, Dan Jørgensen, Esther de Lange, Pavel Poc and Carl Schlyter, Members of the European Parliament. About one million Europeans signed the 8hours.eu petition. Thank to this important declaration, European Parliament officially asks to the Commission and the Council to establish a maximum of 8 hours for the journeys of animals transported to slaughters. The Regulation 1/2005 disposes that “the transport of animals over long journeys, including animals for slaughter, should be limited as far as possible” but it allows long transports in terms of distance and duration, causing animals stress, suffering and even death; for that reason, Mr Zanoni asks to re-examine the Regulation that allows terrible conditions of transportation: in fact sheep, beefs and goats are transported in overcrowd conditions and without air. Since the Republic of Azerbaijan got independence from the Soviet Union in 1999, government handles the situation concerning stray dogs and cats killing them. In particular, authorities of Baku created the Department for fighting against stray animals, which sends in the streets professional dog-catchers on a white pick-up with the sign “icra hakimiyyet”, meaning “executive power”, shooting hundreds of animals, especially dogs. The official reason why they act is rabies, as the government tells to mass media to scare people, but they kill dogs without any proof. When people ask or complain about killings of strays, the Department always replies that they kill infected dogs in a humane way, euthanizing animals. This story comes to OIPA from animal activists of Baku, who maintain that these hunters usually shoot dogs only one time, using only one bullet and letting they die by their self, suffering for many minutes, just to save the expensive bullets. On May 2012, Baku will host the famous Eurovision song contest, so many singers, musicians, important people and tourists from all over the word will visit the city. By chance, in these months killings of strays are enormously intensified and it’s clear that the city administration want to clean up the streets from animals. Despite Azerbaijan doesn’t belong to European Union, it’s a member of the Council of Europe and on 2003 it signed the European Convention for the Protection of Pet Animals, ratified on 2008, which decides that when a country considers that the numbers of stray animals is a problem, it must take the appropriate measures to reduce their numbers in a way which doesn’t cause pain and suffering to animals. The Convention also invites parties to reducing the reproduction of stray animals promoting the neutering of them. Animal activists from Baku animals associations affirm that from 2008 nothing changed. It’s clear that economic interests are involved: In fact, it seems that dog hunters earn a fee per killed dog from the government and they also lie about number of dogs killed, to get more money. OIPA will continue to supervise the terrible Azerbaijani situation about stays.